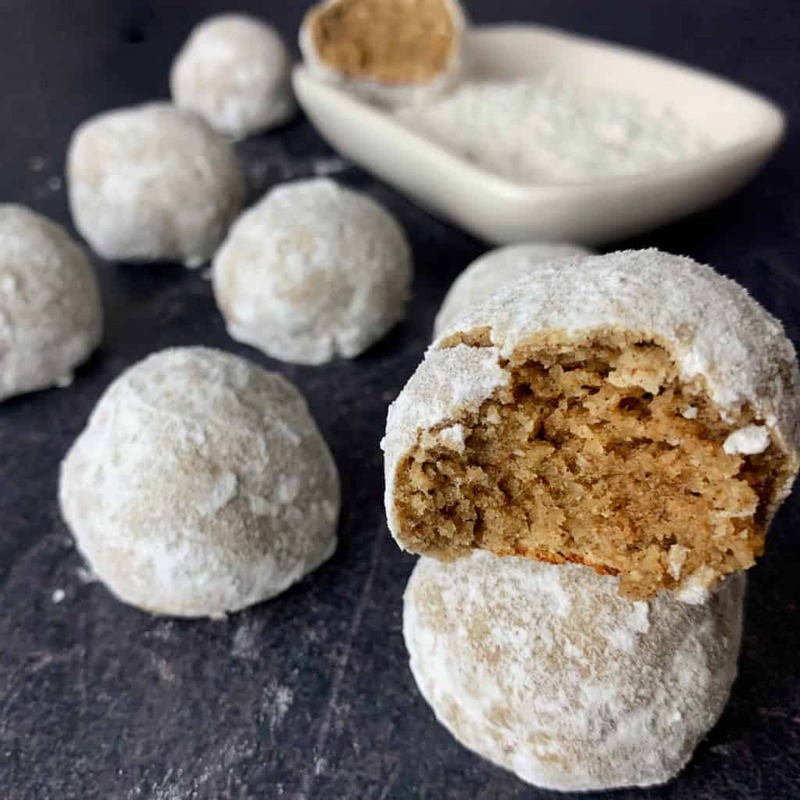 With only five core ingredients and the option to use a blend of spices or store bought gingerbread spice, these protein balls are perfect for a quick and healthy sweets fix. Each one of these gingerbread protein balls has 9 grams of protein and 7 grams of both carbs and fat. And if you’re following a low carb or keto protocol and count net carbs, each protein ball has just 3 grams of carbs. Oh, and I can’t forget to mention they’re unbelievably moist and packed with flavor. You’ll never know you’re eating a low carb, low calorie treat. 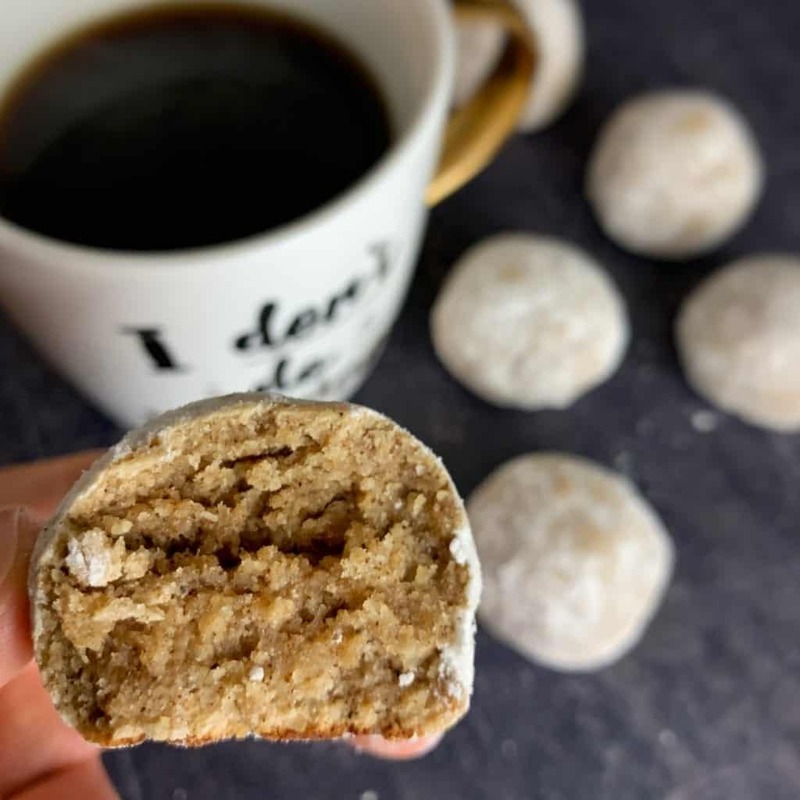 If you’ve made my white chocolate protein cake bites or chocolate cake protein donut holes, these protein balls use a very similar method. In this recipe, you’ll need to mix the dry ingredients in a bowl before adding a bit of butter and apple sauce and stirring to form a dough. You can see this in action in the photos below. If you’re wondering about the gingerbread spice ingredients, I’ll cover that below. Just as a reminder, you can use a pre mixed gingerbread spice to cut down on ingredient needs. Form ’em, bake ’em, roll ’em, and you’re done. Let’s talk ingredients and potential modifications. If you wanted to use this in other recipes, you could easily extrapolate the ratio to fit larger/smaller recipes. 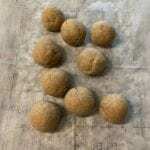 I used PEScience Select Whey and Casein for these gingerbread protein balls. This is one of my two go-to protein powders for my recipes, with the other being Dymatize 100% Whey. Pay attention to the scoop size. One scoop of PEScience is 31 grams. If your protein powder has a 40-gram scoop, it would be like adding an extra scoop of protein to this recipe by the time you’re done. Add liquid ingredients slowly to avoid over hydrating recipes. Likewise, you may need to add a bit more if a dough or batter seems too dry. The two protein powders I mentioned above are thicker and may not require as much liquid as a fine textured powder. If you’re using a plant based protein powder, you’ll likely need more liquid ingredients. Choose a fat source like more light butter or eggs, oil, etc. for best results. 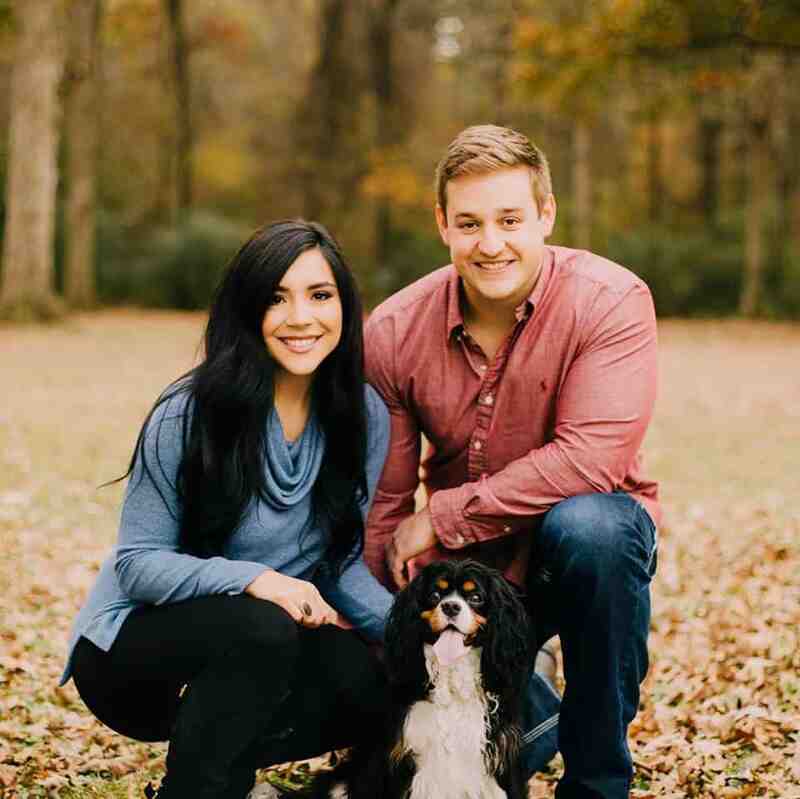 Swerve makes zero calorie sugar substitutes, and their confectioners product is a powdered sugar replacement. I’m not affiliated with Swerve, I’m just obsessed with their products. If you have another powdered sugar replacement, feel free to use that. Or if you’re fine with the added carbs, you could use real powdered sugar. The recipe only calls for 1/4 a cup so the added calories wouldn’t be too crazy. Click here to visit Swerve’s FAQ page about their products and ingredients and click here to see all the recipes on my blog that use Swerve. 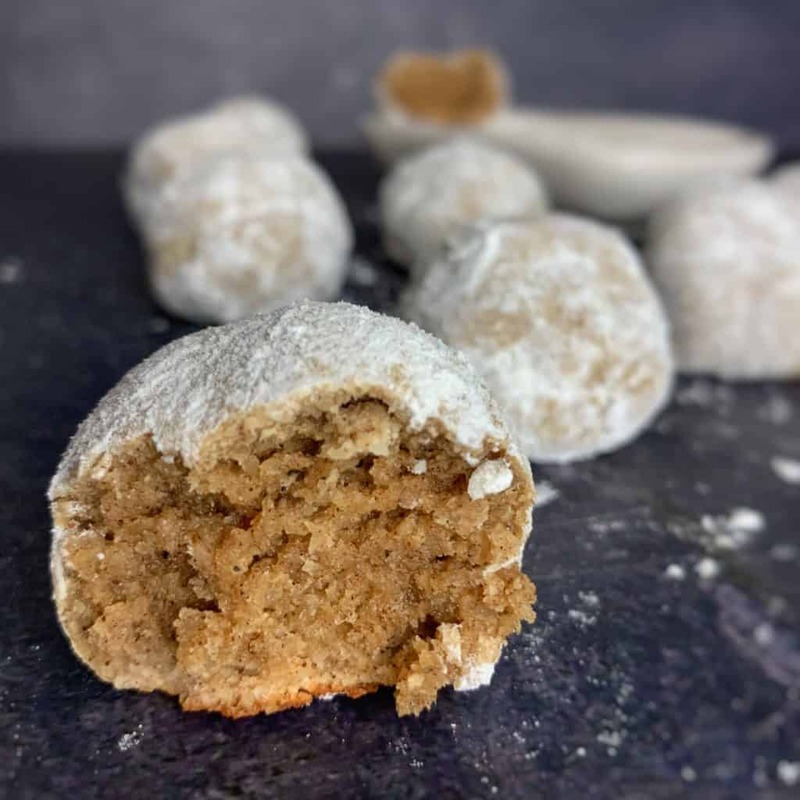 Note: I’ve used a few powdered sugar workarounds in other recipes like mixing a granular sweetener like stevia with protein powder and a thickener like cornstarch or xanthan gum, but I don’t think I’d recommend using those methods in this recipe. 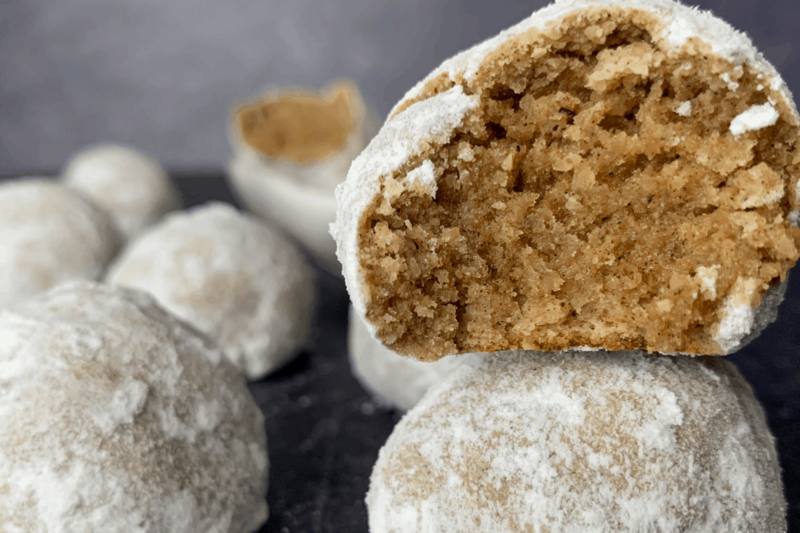 If you wanted to try these gingerbread protein balls with another flour, I’d start with something like all purpose flour. As a disclaimer, I’m not as experienced in converting almond flour to other flours as I am with something like coconut flour. So my suggestions are guidelines, and you may need to play with the recipe a bit to get things just right. Substitute flour at your own risk, nom sayin’? Okay, back to the all purpose flour. In this recipe, I’d start with 1/2-3/4 cup (60-90 grams) all purpose flour in place of the almond flour. 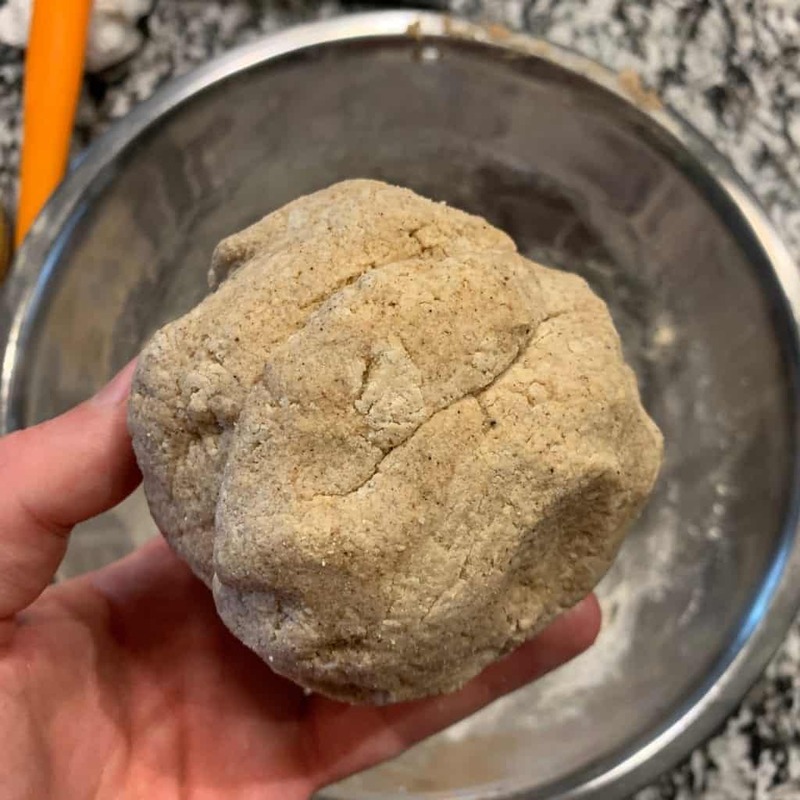 Get a close look at the ball of dough in the photo above for an idea of what yours should look like. If it’s too moist, add flour. Too dry? Add liquid ingredients like apple sauce in this recipe. If you’d like to try using something like coconut flour, I’d start small with maybe 1/4 cup (28 grams) and add as needed. 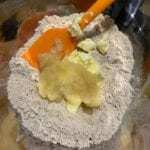 Coconut flour is super absorbent and doesn’t require as much to get flour’s job done. That’s all I have for ya. You’ll find the full recipe below. 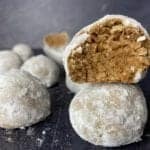 If you make these gingerbread protein balls, I’d appreciate you sharing it with your frands. Or you can take a photo and tag me on Instagram @mason_woodruff, join my free Facebook group and share it with the Proton Party, or pin this recipe to Pinterest. 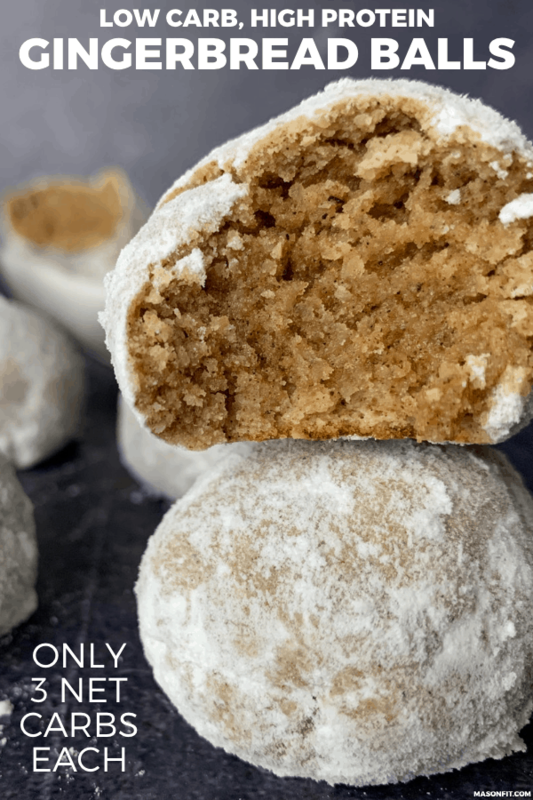 A simple recipe for gingerbread balls that have a super moist cake like texture and are rolled in a low carb powdered sugar. Preheat an oven to 350F and spray a baking sheet with nonstick cooking spray or line it with parchment paper. Set aside. 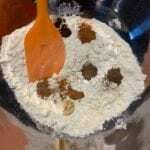 Mix the dry ingredients in a large mixing bowl and stir until everything is evenly mixed. Be sure to get any clumps of flour or Swerve out before adding the liquid ingredients. Add the butter and 2 tablespoons (30g) of apple sauce and stir well. Break the dough into 10 pieces. You can weigh the entire ball of dough and divide that by 10 to know how much each piece should weigh. Roll the pieces between your palms to smooth. The dough should be easy to work with but if it's on the stickier side, you can spray your hands with cooking spray to prevent sticking. Bake for 10-12 minutes or until the bottoms begin to brown slightly. Since there are no food safety concerns like eggs, I like to slightly undercook them (8-10 minutes) so they're gooey inside. Every oven is different but 12 minutes should cook them through. 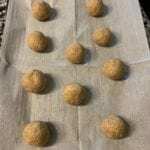 Add the extra Swerve to a shallow bowl or plate and roll the baked protein balls in the sugar after they've briefly cooled. Swerve Confectioners is a zero calorie powdered sugar replacement with 9 grams of carbs per tablespoon but 0 net carbs since Swerve does not affect blood sugar. The nutrition facts contain the carbs on Swerve's label, and I recommend tracking it that way. 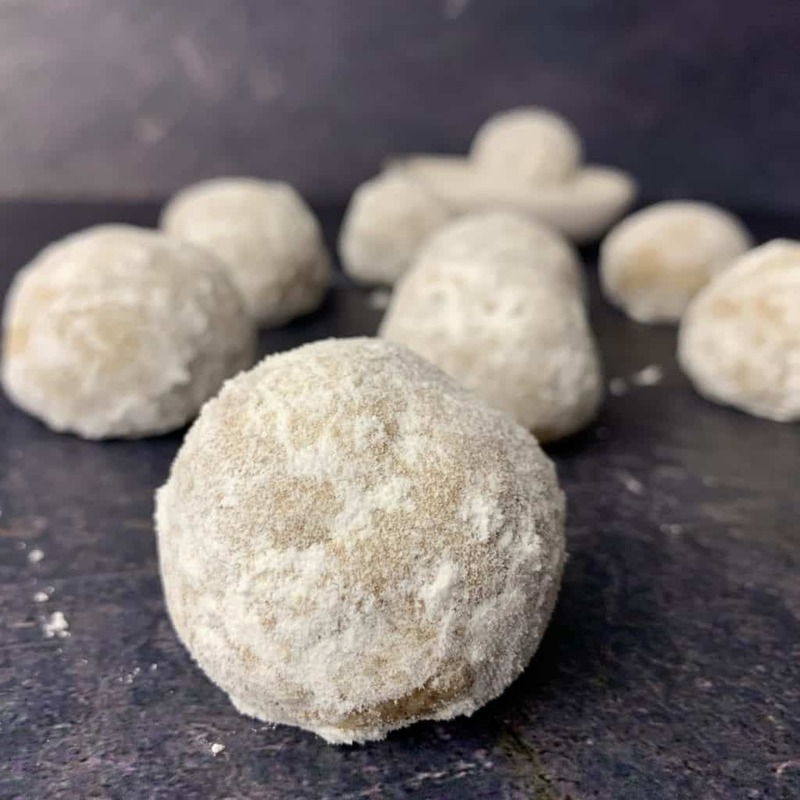 But if you're following a net carbs or keto diet, each protein ball has 110 calories, 9.3 grams of protein, 2.9 grams of carbs, and 7.4 grams of fat. You can swap the butter for another fat source gram for gram if you need a dairy free option. And as a reminder, you can use a store bought gingerbread spice in place of the five spices. If you have modification questions about protein powder, Swerve, almond flour, or gingerbread spice, see the post above. 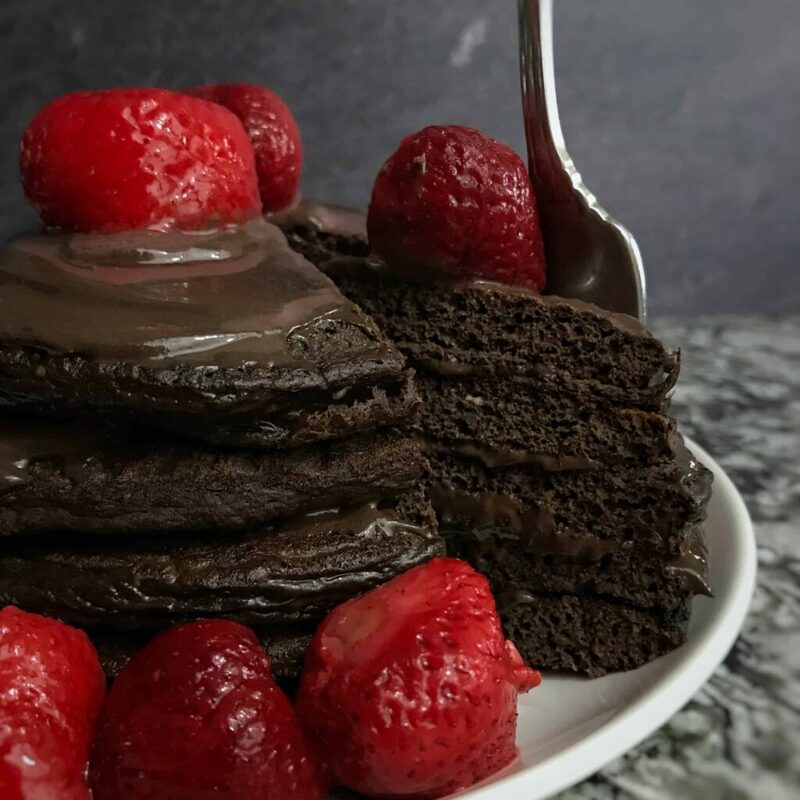 My easy chocolate protein pancakes have 16 grams of protein and only 10 grams of carbs per pancake. They’re also flourless. And if you’re looking for a more savory recipe, my lower carb chicken bacon ranch mac and cheese is a reader favorite. Thank you for including the count in grams for this recipe. In order to lose those last few stubborn pounds over the summer, I had to restrict my daily calorie count to 900 (I’m 73 years old and miniature so not much room for extra kcals) and measuring ingredients by cup or tablespoon wasn’t nearly accurate enough. A “cup of strawberries” is pretty vague. My food scale and I are so bonded I make sure I always have a spare battery on hand. Plus, having gram counts makes it so much easier to halve it double a recipe. 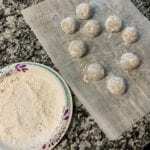 I used Bowmar Nutrition’s Protein Frosted Cookie in this recipe. 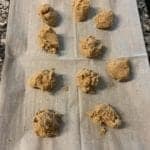 My balls flattened into cookies when I baked them- which originally bummed me out- but I dusted them with some more of the Swerve at the end, and kept them in the fridge, and they held up just fine as cookies! They’ll satisfy your sweet tooth, without sabotaging your diet. 10/10 recommend! I LOVE these for breakfast with coffee!! Used Aldi vanilla protein powder (Bowmar nutrition we NEED vanilla) and they turned out great with the Aldi brand. I left these on counter for 2 days in a baggie and the. Put them in fridge after that- these will definitely be a regular!